There's no denying that I'm an Italian American and even though I appreciate and understand what authentic Italian food is I will always have a tender spot in my heart for dishes like the Baked Eggplant below. I grew up in a very ethnic neighborhood. A place where pasta was called macaroni, sauce was gravy, and dishes like baked eggplant focused way more on what made it ooey gooey than on the eggplant itself. This is how we ate and how I grew up. Today I realize there is so much more to good food and that focusing on the vegetables should be top of the list. Food in it's most natural form is delicious. These days I prefer grilled eggplant drizzled in olive oil; but that's not to say that on occasion, I look back at my heritage and delve into dishes like this head first. Thinly slice eggplant lengthwise. Place on sheet pan that has been prepared with some olive oil. Bake in oven on 350 until soft. About 20 minutes depending on size and thickness of your slices. Remove from oven and set aside. In the meantime, thinly slice garlic. In a 3-quart saucepan, heat the olive oil over medium heat. Add the garlic, and cook until soft and light golden brown, about 8 to 10 minutes. Add the tomatoes and their juice and bring to a boil, stirring often. Lower the heat and simmer for 30 minutes. Sauce will get thick. Season with salt, pepper and basil. Whip ricotta cheese with olive oil, nutmeg, salt and pepper to taste. Cover the bottom of a 9x9 baking dish with the cooked tomato sauce. Arrange eggplant lengthwise and side by side covering the bottom of the baking dish. 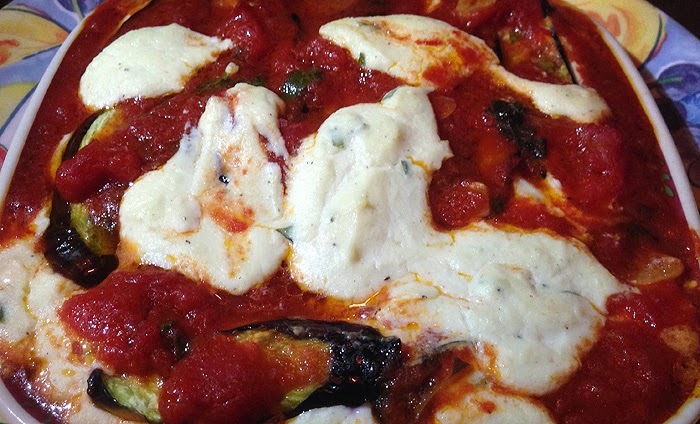 Spread ricotta mixture on top of eggplant and cover with additional eggplant slices. Top with tomato sauce. Continue to layer until everything is used. Extra ricotta can be spooned on top. Bake in oven on 350 until heated through...about 30 mins. i love eggplant!!! this looks marvelous! I've often wondered if "other" eggplants would work in dishes like this. Now I know; thanks!